After officially merging Barksdale Theatre and Theatre IV, Virginia Rep has further solidified its position as the big dog in town. The company offers more than a dozen works a season, ranging from such family-friendly fare as "Madeline's Christmas" to expletive-laden, challenging shows such as "Spring Awakening." Despite the uproar in the theater community over the ouster of founder Carol Piersol, the Firehouse Theatre Project still made the number two spot, offering edgier contemporary theater with a classic or two thrown in for good measure. 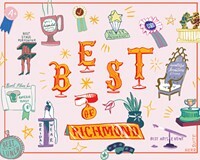 With its mix of serious works and zany romps, Richmond Triangle Players has scooped up the number three spot. "After merging the two theaters, we are feeling a lot of positive energy and momentum," says Bruce Miller, artistic director for Virginia Rep. "We have long felt privileged to create professional theater in a community with such talented colleagues."